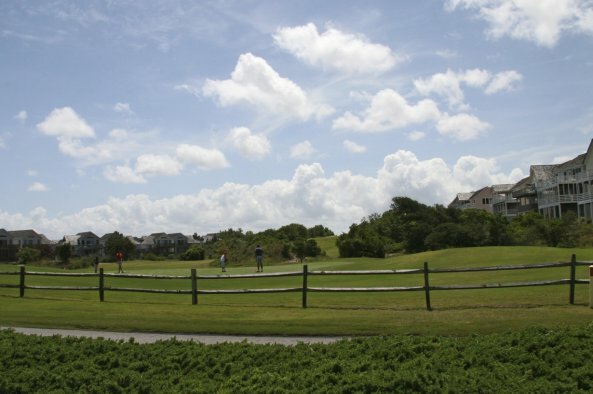 The Village at Nags Head is a 400-acre upscale golf and beach community located in Nags Head that stretches along a glorious mile nestled between the sparkling Roanoke Sound and the dunes and surf of the Atlantic Ocean. 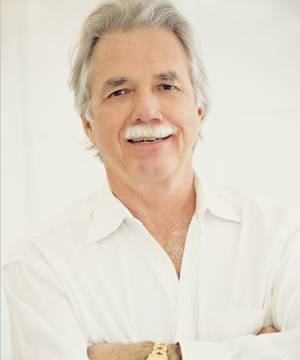 Homesites and custom-built homes are available on the oceanfront, oceanside, soundside along the Nags Head Golf Links, and soundfront. 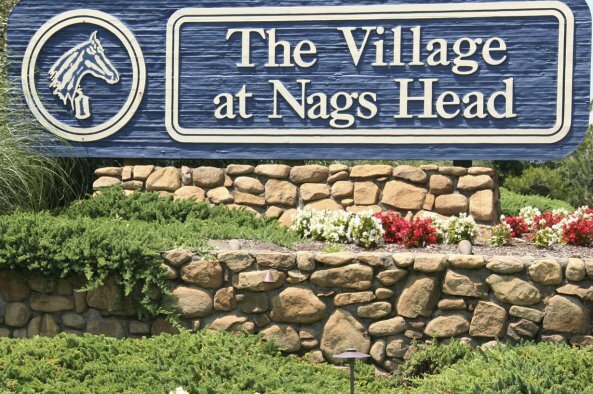 Homeowners in The Village at Nags Head are eligible to purchase memberships in the Village Beach Club and the Nags Head Golf Links. Guests of members of the Nags Head Golf Links are eligible for reduced rates. 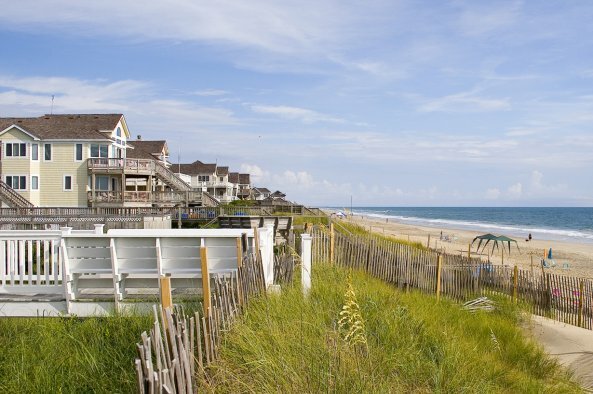 Additionally, all of the luxuries and amenities that make a great family vacation can be found here at The Village at Nags Head. The Village Beach Club — Social and recreational activities center around this beautiful oceanfront beach and tennis club. For members and guests only, The Village Beach Club makes the most of its oceanfront location. The club boasts of an Olympic-sized pool with lap lanes and diving board, and a children's only wading pool; Red Cross-certified lifeguards; scheduled swimming lessons; and a snack bar and café with a full-service bar serving lunch. Swimming, tennis, a daily schedule of kids activities led by the activities director, game room, and the traditional Wednesday night cookout are just a few of the reasons why your family will love spending days here. You'll love the views and the fabulous beach. Sunny memories are made here!Nags Head Golf Links comes with dramatic views of manicured greens, brilliant against the blue backdrop of Roanoke Sound. As sailboats breeze by, golfers can tee off on a true links course that, like its Scottish model, hugs the coast and all its contours. Play the challenge and see if you agree with Golf Digest " ... the holes along the sound are among the most beautiful in the eastern United States." Two Soundside Parks with piers that extend out into Roanoke Sound. The parks are the perfect spot for sailing, windsurfing, kayaking, crabbing, swimming, fishing and a host of other water sports. These parks are the the ideal spots for evening picnics while watching spectacular sunsets. 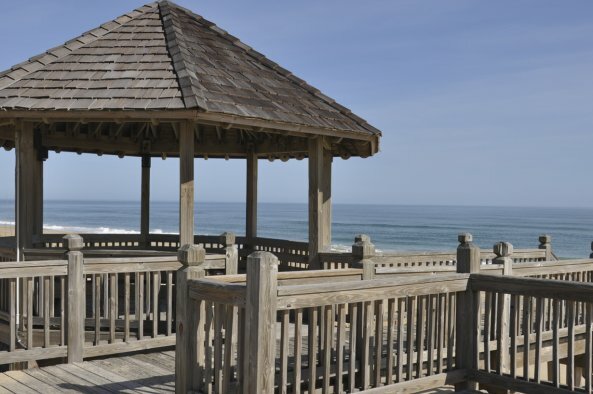 The Village Oceanfront Bathhouse is located at the north end of the community and is for the private use of The Village at Nags Head owners and guests. The Bathhouse is accessible to the handicapped and includes showers, bathrooms, sun decks and a gazebo. A secluded oceanfront retreat for those quiet moments in the sun. The Village Shuttle Bus is available from Memorial Day through Labor Day for homeowners and guests to travel to and from their vacation home, the Beach Club, Golf Club or the shopping mall located within the resort. Just call for a ride!